A "730" event is very serious in nature and requires an inspection to be performed before the secret reset button (location not divulged to pilots) is pressed and the engine can be started again. Bord 107 was regularly seeing the 700°C light flash on take-off and the situation was mitigated by pulling the throttle back a bit. But too much of that and the turbine will start spitting blades out the back. Soot buildup in the combustion chambers eventually disturbs the flame pattern, causing the combustion to continue as it moves further back. Flames licking at the EGT probes behind the engine gets the warning light to start screaming, "Ow! You're hurting me!" Over time the ventilation holes in the inner jacket get, as our very German adviser says, "stuffed like little bratwurst". Lack of good air flow prevents a good clean burning of the fuel. The problem initially manifested itself as a drop in the HPC (high pressure compressor) RPM. Our Czech mechanic had adjusted the fuel controller to put a little more fuel in to bring the RPM back up. That brought the RPM back up, but the EGT came up with it... in effect, it only made the problem worse since extra fuel burned even longer and even farther back in the compressor area. Taking a look at Bord 107, that's what we saw — and Brad has a whole new respect for jet exhaust! Fortunately, there is a solution, although not a simple one. 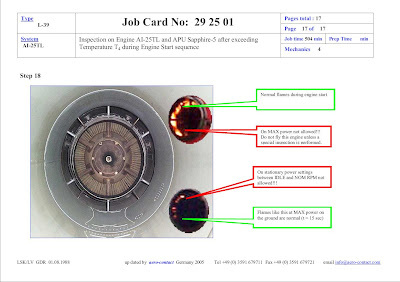 The first step was to send all the instruments to Bernd in Germany to have them inspected and calibrated; it simply wouldn't be possible to get to a "correct" solution without accurate readings on the instruments. After Aero Contact's analysis, the instruments were judged to be in tolerance, although the front and rear RPM indicators need to be swapped so that the more accurate one would be in the front cockpit. Historically there have been a number of ways to deal with soot buildup in jet engines. One of the simplest ways to clean an engine is to fly through heavy rain. The scrubbing effect of the water and steam will do wonders for a mildly dirty engine. Rain water has the added benefit of having a very low mineral content, so it's much better for the engine than tap water. Another simple method was to bring the engine up to speed and throw a small amount of ground Walnut shells (yes, WALNUT SHELLS) into the engine. While this worked reasonably well for centrifical flow engines, it doesn't work quite as well for axial flow engines... and a hard chunk of walnut shell can do more harm than good. The more modern method is to spray a solvent into the engine in one of two methods, either OFF-LINE or ON-LINE. Off-line (or "crank washing") an engine consists of "cold" rotating the engine at 20-25% RPM and soaking it down with solvent. On-line washing injects the solvent while the engine is actually running at about 90%. Using both methods together generally results in a good cleaning. Caustic solvents were originally the preferred detergent for cleaning engines, but they were an EPA nightmare. A lot of chemical engineering has gone into producing water-based solvents such as TurboTect 2020 that are almost as effective as the old solvents and the effluent doesn't have to be carted off in a HazMat truck. The water-based solvents do a little better job on hardened salts but not quite as good a job on small (35 micron or smaller) particulates. A number of patents have been issued in recent years for solutions to this problem. Bernd is sending a special injection tool to do crank washing deep within the compressor section. A few cycles of this kind of cleaning will reportedly bring the EGT down as much as 40°C and improve the power output by several percent. The instruments, injection tool and a 55 gallon drum of solvent should all be here this week... and none too soon, it's hot enough in Texas! Note to self... adjustment was "screw 28, one click left (counterclockwise)"